Haitian Earthquake - Here is something that YOU can do!! 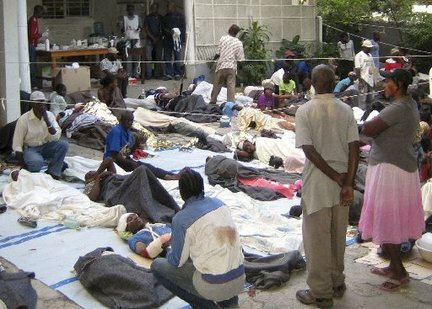 This is the first hand account of the Haiti Earthquake by a family friend, Mousson Pierre. Mousson is the CEO of ORE, an NGO established in 1985, to improve environmental, agricultural and economic conditions in rural Haiti by promoting high revenue tree crops, improved seeds, and marketing programs. Moussan is IDEALLY situated, with deep roots in the community, to effectively help victims of the Haitian Earthquake Disaster. Visit her website at www.oreworld.org to find out more, view photos, and DONATE to an NGO that can really HELP RIGHT NOW!!! This is what is happening thanks to you! been doing before. Meanwhile we could hear people in the vicinity talking loudly, everyone asking 'what was that'? Few minutes later, it started again. No hesitation this time to immediately run outside! Outside I started to feel my legs trembling, as if I had been running or overexerting myself. I just felt scared. Felt completely vulnerable, at the mercy of a force obeying its own will. And the words, my spiritual mantra, came by themselves rolling on in my head. The second quake lasted less time than the first. Then we all became restless. Suddenly we began to wonder how everyone else was, if it was only a local thing. At that point I got a call from Patrick in Les Cayes, the closest town. He was asking: 'did you feel that, what is happening'? He said that he'd heard of one house destroyed in Les Cayes, and that there was serious damage in Port-au-Prince. So I immediately started to call people in Port-au-Prince, but none of the calls went through... Then I noticed on my laptop that the earthquake was a news item on Yahoo, just describing the magnitude and location of the epicenter. I couldn't believe that we had felt it so strongly when the center was in Port-au-Prince, 190 kms away! I went to my house, which is just a short distance from the office compound. Only then did I realize that I hadn't thought to worry about my mother, who is bedridden, but who was in fact fine. After a while Benoit and Eliassaint came to look at the house and decided it was safe, no cracks from the quake. I remembered that I could watch the news on CNN, and then it became clear that Port-au-Prince was very badly hit. 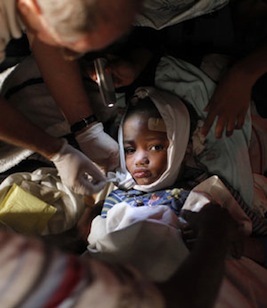 We became frantic to reach anyone in Port-au-Prince, Eliassaint has all his kids there. No calls were going through. 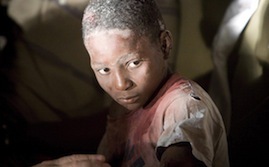 At 10:58 pm (as recorded by cell phone) I received a call from Makil in Port-au-Prince: his words just made me grow cold. The house where I stay in Port-au-Prince, our office in Port-au-Prince, was down! He had just rushed out when the walls started to crumble, as he heard the crash of the neighbor's walls in our back yard. The houses to the left and right were down. An old lady was trapped in one of them, and her son (who had been standing outside) was being helped by neighbors to try and reach her. Makil, an ORE messenger, a faithful collaborator and friend, was out in the street where he intended to just stay for the night. He spoke of the destruction he had witnessed, telling me how many of the city's landmark buildings were destroyed: the Presidential Palace, the Sacré Coeur church, the Tax building, the local supermarket. These, he and his son, had seen with their own eyes. I could hear the sadness and the incomprehension in his voice. I wanted desperately to find out about all the people I know in Port-au-Prince. I felt helpless and frustrated. Then I got a call from my sister, Micky, who lives in Paris. She had just heard about it on the radio. I told her to watch it on TV, then she would understand. I reassured her that Camp-Perrin had been spared, explained Makil's plight. During the next 24 hours I was just numb, in shock, searching for news, waiting to hear from friends, relatives. Then suddenly, realizing that we needed to be doing something to help. We were safe, we live in an area that had been spared! We have Internet and electricity and all around everyone was worried sick, trying to get news of their loved ones. The plan for rescue started to take form: the idea of setting up a refugee camp, to try and get people out of the nightmare in Port-au-Prince. As we started planning, offers of help started flooding my email box, and it became clear that money would be available to provide the necessary logistics (tents, food, hygiene kits, water, clothing). Discussing it with the ORE team and other local groups, we realized that the first priority was to evacuate as many people as possible from Port-au-Prince, to get people originally from Camp-Perrin out of the city. Every day now we have buses with more than a hundred evacuees. As the numbers of homeless people, without means and in need of medical assistance keeps rising, we are beginning the longer-term phase of providing shelter in available buildings, and when that is full we will be setting up a camp for vulnerable survivors who have no family and nowhere else to go to. While the evacuation process continues, we are using the funds which have been so generously provided to give homes and basic necessities to the homeless. incredible. I have never seen Haitians so exuberant, hugging and hugging me. All day long the next day, people, school kids, are stopping by to thank us." All your support is making such a difference to the lives of those helped. It is hard to imagine the happiness and relief of finally being helped to leave a nightmare of such enormous proportions. Every little penny helps to save children like these..... and their families. By giving to a local NGO with deep connections to the community you can bypass politics and lack of local resources, thus ensuring that the money you give can GO FURTHER and have a GREATER IMPACT ...RIGHT AWAY!!!!! You will find an organisation with a long history of helping the economic and social development of Haitians. and GIVE what you can!!!! Your money will immediately be spent on food, medical supplies, hygiene supplies and other needs of those who are in need and homeless in Haiti.